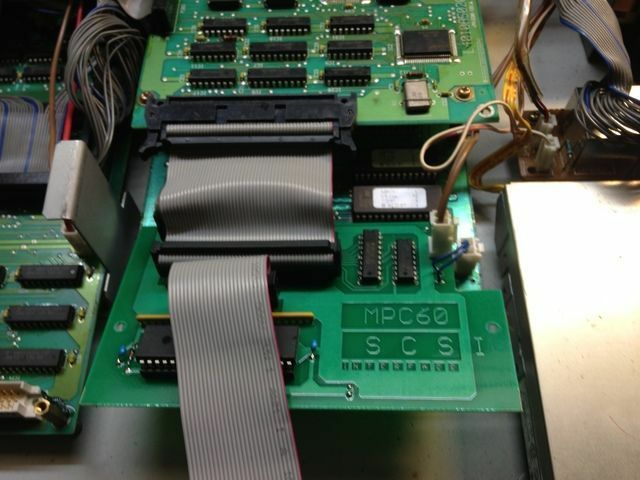 I recently purchased a SCSI Board for my MPC 60 MKI off eBay and I can't seem to find any detailed installation instructions anywhere on these forums or the net. I used the search function but only found a couple vaguely detailed posts directly related to this topic that didn't help me out. I also checked the MPC 60 yahoo group and came up empty handed as well. I understand that the Roger Linn site used to sell these boards and I'm assuming they came with installation instructions at the time. Anyone have a link to an installation PDF or a website with detailed step by step info? Or better yet can anyone provide me with step by step instructions? 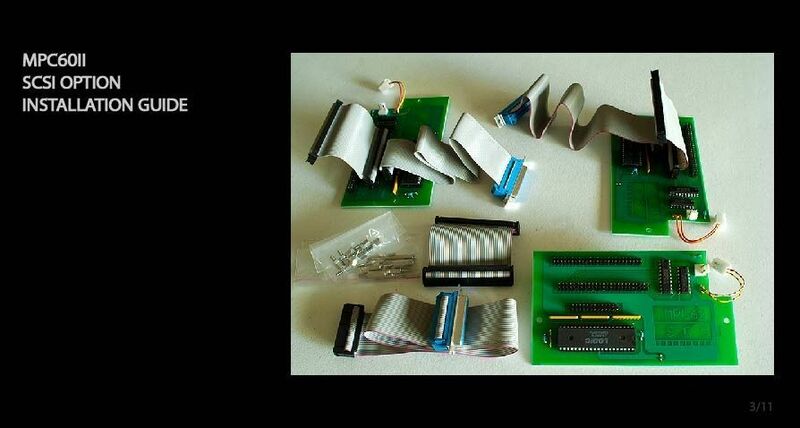 I'm usually good with these types of computer/musical hardware related things and the installation seems pretty straightforward but I don't want to risk possibly damaging my MPC 60 or the SCSI board. 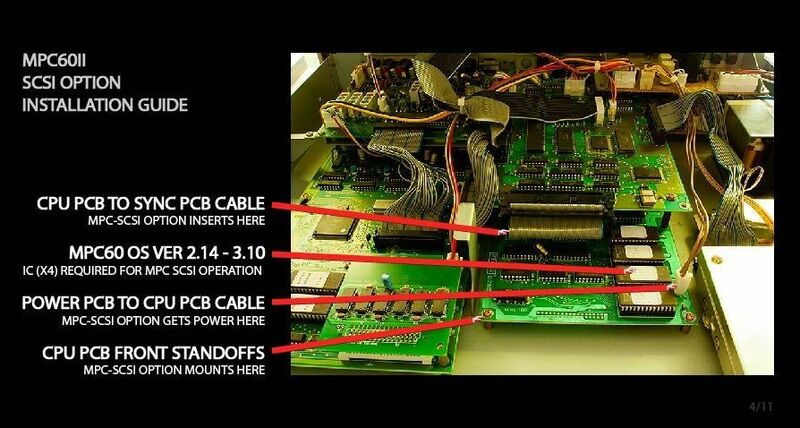 OK so heres the pic of the scsi board. ok now, the blue part of the long ribbon, is your connector for the back. Remove the connector labelled rs 232 on the back, and this blue part fits exactly where this did. Now your actual scsi board fits here. Notice the floppy drive just to the right. Note this is not a picture of the official marion systems board, but it is exactly the same. Now you fit the 2 little standoffs and screw the board down, the short stubby ribbon cable plugs into the board just infront of the scsi board. You swap the little 2 pin power connectors over. 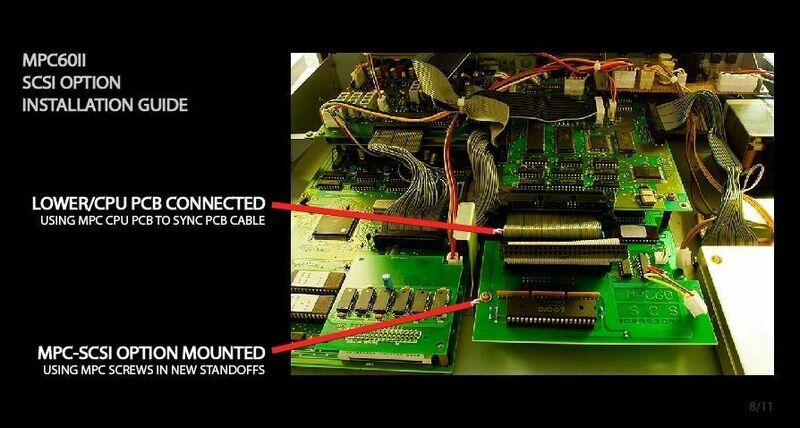 (the one that was connected to the original board is taken off and placed onto your new scsi board, and then the little short 2 pin wire connects where that one did. Lastly the long ribbon cable gets plugged into the only remaining slot on the board, and there you have it. Ottomatic wrote: Anyone have a link to an installation PDF or a website with detailed step by step info? Or better yet can anyone provide me with step by step instructions? Just posted this in the MPC60 Bible thread in response to your post, sadly there are no pics to guide you but these are the words from the PDF. Now that the chassis is open, the remaining steps are nearly identical for the MPC60 and MPC60-II. 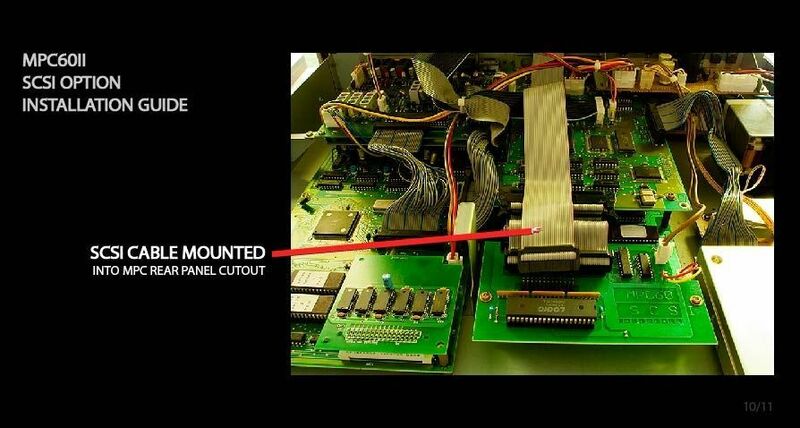 • If you have an MPC60 (not an MPC60-II), you must remove the RS-232C connector upper assembly from the rear panel. To do this remove 2 screws from rear panel. Discard these screws— they will not be used later. Then, disconnect connector from inside and remove P.C. board assembly. This will not be reinstalled. very careful when lifting the lid (to gain access to these screws) so as not to disconnect any internal wires. This cover plate and the 2 screws will no longer be used. • Disconnect wire from connector by squeezing the small plastic pin on the side of the connector. Leave wire disconnected for now. • Remove large flat cable from connector by pushing restraining pins on either side away from each other and gently remove connector from socket. Leave it disconnected for now. • Remove 2 screws and washers and set them aside for now. Don’t lose them— they will be used later. In the same holes, install the 2 hexagonal spacers supplied with this kit. 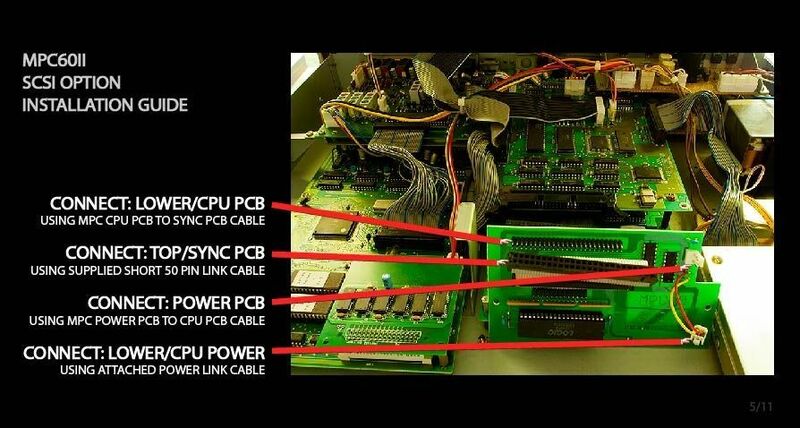 • Place the MPC-SCSI board on top of 2 hexagonal spacers. Secure it in place with 2 screws and washers which were removed from holes. 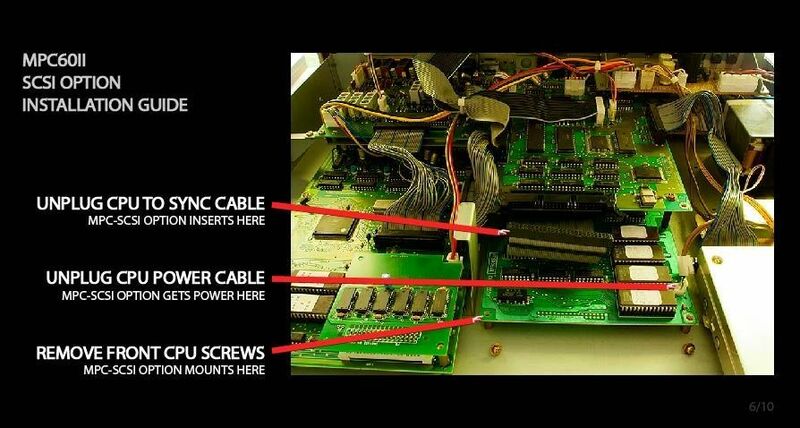 • Install flat cable (attached to MPC-SCSI board) into upper P.C. socket on upper P.C. board. • Remove 2 hexagonal threaded spacers from connector (attached to MPC-SCSI board by long flat cable) and insert connector into hole in rear panel. Secure it to the rear panel with the 2 hexagonal threaded spacers you just removed. • Connect wires “P” to connector “Q” and connect wires “E” to connector “F”. • Check to see that all cables are connected. If everything looks OK, close the lid. (On the MPC60-II, carefully place the top section back down on the bottom section.). Don’t put the screws back in yet— we’re going to test it first. • Connect the power cord and turn the power switch on. The screen should quickly display some text. If not, immediately turn the power off, disconnect the power cable and check all previous steps. Especially check to see that all connectors are reconnected correctly. • If text appeared on the screen when power was turned on, indicating correct operation, then proceed with reassembling the unit. To do this, first turn power off and disconnect the power cord, then install all screws in the same places as during disassembly. This may be a bit cryptic and difficult to follow without the pdf illustrations, but it is a simple operation. Look at some photos of the SCSI installed to get visual info. If I can find a link to the pdf, I'll post it. Thanks for the quick responses, I think I have it figured out now. I ordered the board from a guy in France so it won't be here for another week or so. I'll give an update on how installing it goes once it gets here. From the photos I've seen it looked pretty simple but the power cables are what had me a little confused. Do you have an MPC60 OS version that supports the SCSI interface? Yes, I purchased the 3.10e OS from Roger Linn's website a few months ago. It should be very straight forward then, with the photos above, there isn't much that can go wrong. 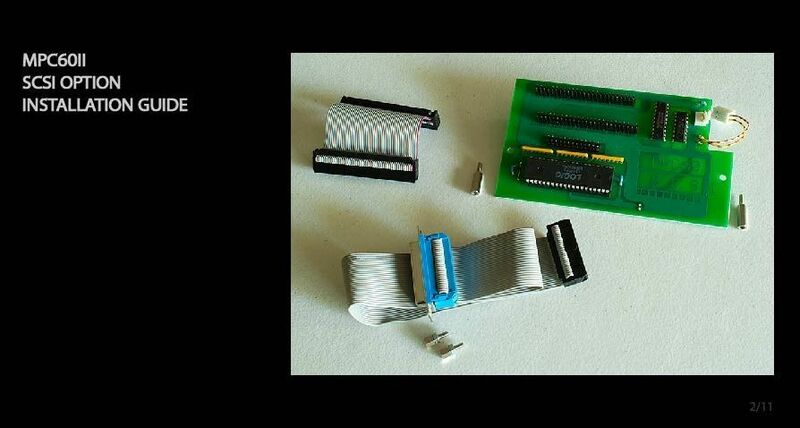 As long as you are OK with external SCSI devices...if you want internal SCSI devices, then you will need to mess around with a couple of adapters for the external DB25 connector, and possibly floppy drive power, as well. For the time being I'm going to stick with external SCSI. I'm paranoid that my floppy drive is going to quit on me one day when I least expect it so I figured I'd take precautions by buying the SCSI board. My sound library for my MPC 60 has over 200 disks in it, about a quarter are factory sound libraries. I'm going to finally start modernizing it once I get around to it. I had a zip 100 drive but it "clicked" on me so I think I'm going to go the compact flash route this time around. 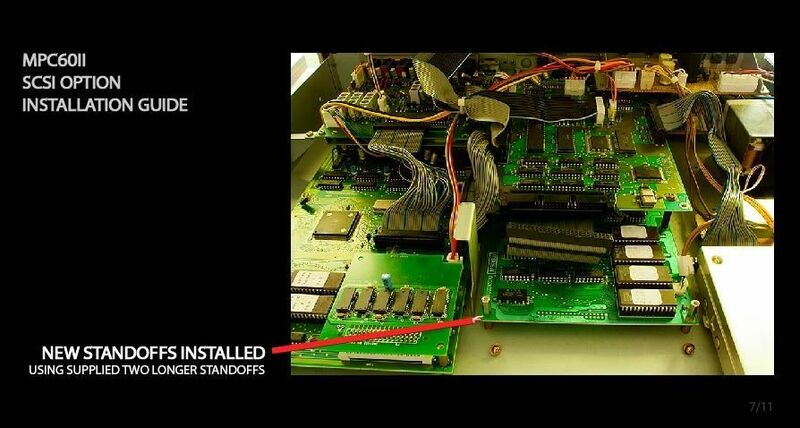 Ottomatic wrote: I recently purchased a SCSI Board for my MPC 60 MKI off eBay and I can't seem to find any detailed installation instructions anywhere on these forums or the net. 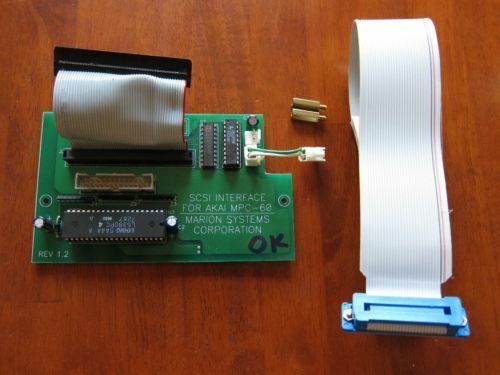 The connection between the SCSI board and the sync board - this connection appears to use a standard 50 pin ribbon cable except that instead of a single key ensuring you connect it the correct way - it has 2 keys spaced equidistant across the top of the receiving end. 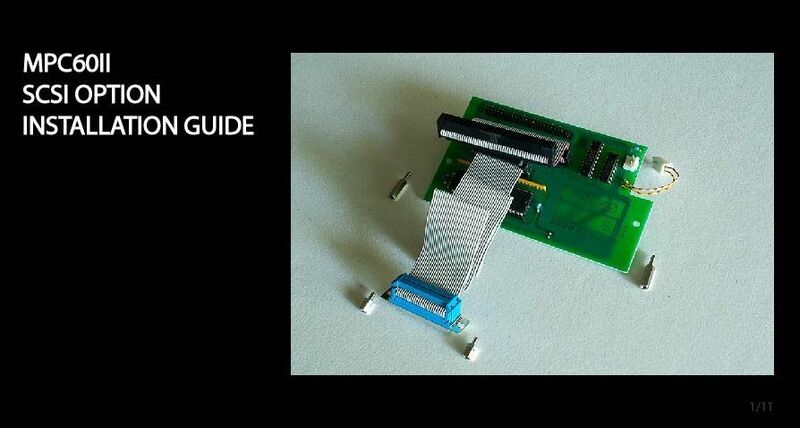 A standard ribbon cable with a single key in the center will not connect - the problem is: I am having a difficult time finding the correct cable anywhere. Is this familiar to anyone?